Siemens washing machines are designed to make your laundry day as easy as possible. Each Siemens washing machine in our range can save you time and energy with a variety of programmable functions and load capacities that are ideal when it comes to your specific needs. If you have a big family, choose a Siemens washing machine with a higher load capacity and you’ll find the chore of washing is reduced when you have fewer loads to do. And when you’re in a rush, select a short spin cycle and you’ll be ready to go in no time. Siemens washing machines feature advanced technology to ensure your washing comes out spotlessly clean after every wash.
Because you can program Siemens washing machines, you can tailor each wash to get the most out of every spin. Short washes are economical and energy efficient as they take less time and use less water than a standard wash. And if you regularly struggle with heavily soiled clothes and fabrics, you’ll be surprised how effective the advanced technology of a Siemens washing machine can be compared to a range of other washing machines. 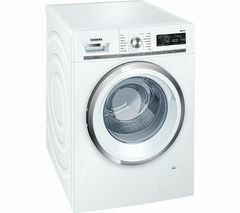 Choose a Siemens washing machine to save time and effort on laundry days.